I recently came across some very old articles in Ceim magazine which featured some adverts right back to the announcement of my business. Ceim was a regular publication from An Coimisiun and was a forum for teachers to have articles published and a means of communication for An Coimisiun to keep teachers up to date on events and developments in Irish dancing. In the early 1970s my Dad had worked in the shoe industry for Clarks in the work study department and had a vast knowledge of shoemaking. But he saw that the demise of this industry was imminent. His involvement with An Coimisiun and his professional background in footwear plus the difficulty he knew existed for dancers in procuring dance shoes, sowed a seed in his mind and so was born an idea to combine his work and his love of dance. He began a small mail-order service from our home for Irish dance shoes in 1972 and over the next number of years the natural course for him was to commit full time to his own business and resign from Clarks. 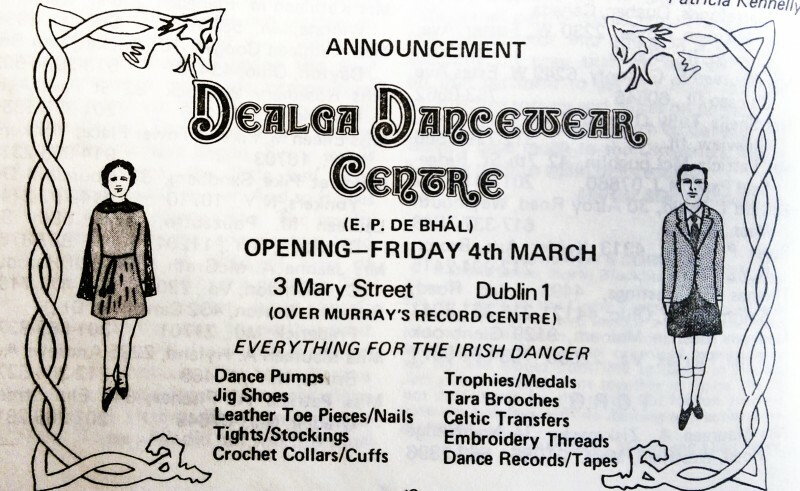 In 1977 on Friday 4th March he opened Dealga Dancewear Centre in No.3 Mary Street, Dublin. This was the worlds first and only dedicated Irish Dance shop. I can remember those times helping out as a 4 year old at home and as an 8 year old in Dublin. At the time, Oireachtas Rince na Cruinne, the World Championships were held in the Mansion House in Dublin or in the Pavillion in Dun Laoighre and there would be queues of dancers out the door of the shop and around the corner into Capel Street, when, they would be in Dublin for the Worlds, to stock up on shoes and accessories. In 1992 I came on board full time and worked in Dealga Dancewear, commuting from Dundalk to Dublin daily by train until 1992 when the focus of the business switched from retail, more to wholesale. More and more dance shops had sprung up during the intervening years and we began supplying these with shoes. Boyne Walk was born from this switch and we’re still in business 43 years after the first pair of shoes left our house in Ard Easmuinn in 1972. And how the business has changed.